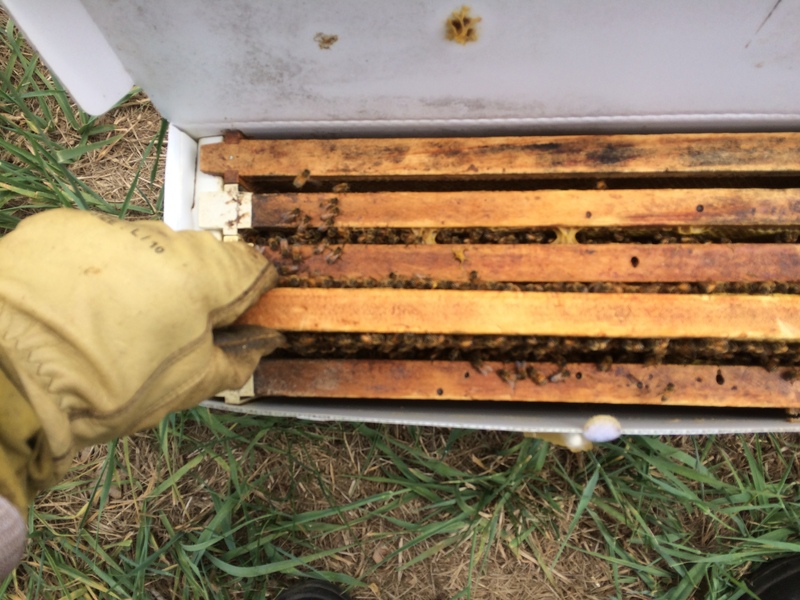 EezyBeez – Beekeeping in the Southern Highlands. We are very excited to announce that John has recently become chosen by Flow Hive as a Certified Flow Ambassador. So what does this mean? This John is able to offer assistance and support to flow hive users in and around the Southern Highlands area and using the unique link at the botom of this post you can purchase your own Flow Hive at an exclusive discounted price. This is your chance to become part of the Flow Hive community and enjoy the buzz of this revolution in beekeeping. Enjoy the thrill of working with the bees and benefit from their hard work as they pollinate plants in your area and produce delicious sweet honey that you can harvest direct from your hive. There is no mess and much less effort than extracting honey be conventional methods and you get raw natural honey. To get your very own Flow hive and satrt your beekeeping journey click on the image below and John will be in contact with you to make sure your Flow Hive arrives safely and get you started on the right foot. We cant wait to meet you and help you acheive the sweet rewards of beekeeping. While you are waiting for your hive to arrive enjoy some videos of the flow hive in action. Join John from EezyBeez for this one day intensive beginner beekeeping workshop. Learn about bee behaviour, the equipment you will need to get started, rules of beekeeping and how to manage your hive for success in beekeeping. Workshops are limited to 10 people. Beesuits are available if required but best to bring your own if you have one. If these dates don’t suit you then a workshop can be organised for groups of 4 -10 people. Spring time means swarm time. Things are still a little cool in the Southern Highlands at the moment but as the weather warms up bees will start to swarm. understand what they actually are so I thought I would try to explain what it happen here. During the cold months of winter the bees dont produce may young as food is scarce and they need to use what they have sparingly. When the weather warms up and spring flowers start to bloom pollen and nectar are suddenly in abundance and there is a sudden population explosion in hive population. As the population increases there will be a point where the bees feel the hive has enough population for them to establish a new hive. This will trigger the hive to prepare to swarm. Swarming isnt just the hive looking for a new bigger home. It is actaully making two hives from the old hive. When they swarm only about 50% of the bees in the hive will leave. The rest will stay to continue the old hive. When the bees are preparing for a swarm they make queen cells to produce new queens. These are not to make a queen for the new hive, but are to produce a queen for the existing hive. The hive will generally make between 4 to 6 queen cells and sometimes more. Before they swarm the bees that will swarm gorge themselvs on honey to take with them to the new hive so they can start building honey comb right away. This of course does take quite a lot of honey from the existing hive but the swarm would find it hard to initially set the new hive without it. When the queen cells are a day or two from hatching the old queen will leave the hive with about 50% of the population of the hive and they will find a branch or some other place to cluster. This cluster is just a temporary location for the new hive while scout bees look for a permanent space for the new hive. 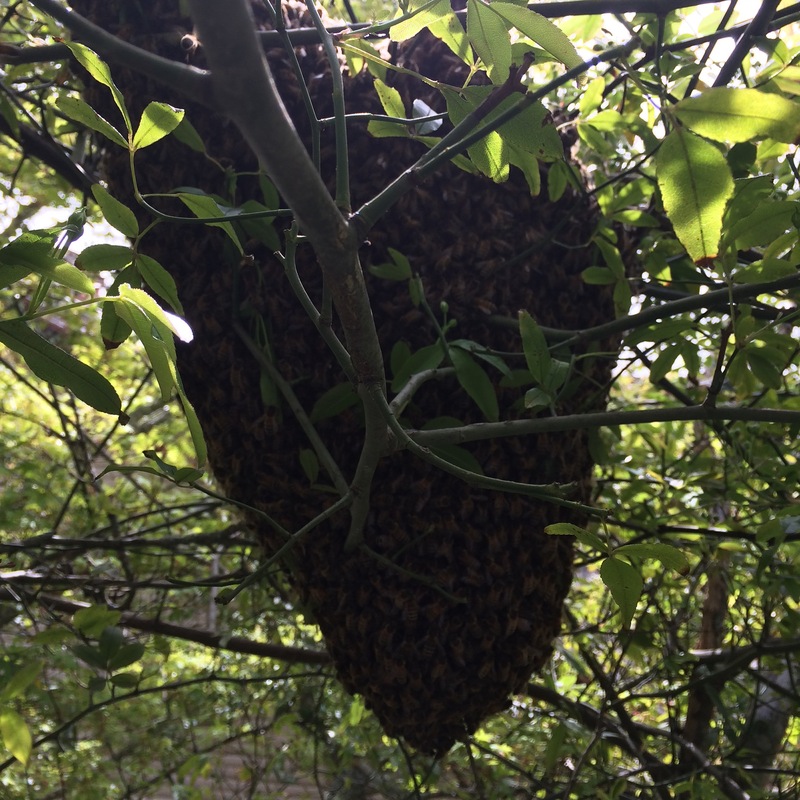 This cluster is what people call up about when they are concerned about bees building a hive in their yard. In fact this cluster will normally only hang around for a day or two. This can however be quite an inconvenience and often a bit of a danger. Even if the location of the cluster isnt an inconvenience it is still worth calling a beekeeper to collect them and the reason why is simple. The new home that the bees find could be in a wall cavity in someones home or their favourite summer shade tree or some other inconvenient place. A beekeeper can collect the swarm and give them safe home, for the bees and people, where they can be quite happy. Now to continue with the swarm story. Once the scouts find a place to set up a new hive they come back to the cluster and do a dance that some call the wiggle dance. They do this dance to tell the other scouts about the place they found. The location and how good they think the possible new is are all communicated in this little dance. Based upon the quality of this dance, more socuts will go and check the location for themselves and will return and if they like the place they will do their own dance. If they dont like they will not dance. This goes on until there is an overall weight of opinion in favour of one location. That is most of the scouts are dance for the one hive. Once this new location has been decided, the old queen and all the workers and often some drones, will fly off and set up a new hive. At the same time the queen cells are hatching in the old hive. The forst queen to hatch will go around to the other queen cells and attempt to kill them by chewing a hole in the side of the queen cell and sting the unhatched queen to kill her. once she has killed them all her place as the queen is confirmed. Sometimes two and and possibly more queens will emerge at about the same time. In this case one of two things can happen. The queens will fight to the death with the winner becoming the new queen or one fo the queens will fly off with about 50% of the remaining population and set up another hive. How the hives makes this decision is not really known but it could rely a lot on the amount of resources in the area and if the hive thinks there is enought to support another swarm. Once each queen is established in their respective hives they will once again build up their population so that they can collect enough honey and pollen to store for winter and then in the following spring it will be time to start the process again. 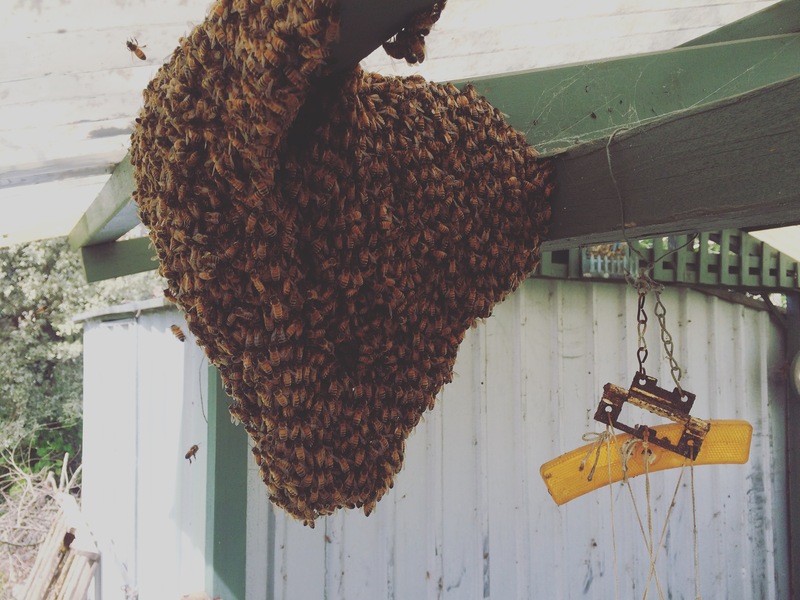 I hope this has been interesting and spread a bit of light on what is happening behind the scenes when a swarm arrives in your yard. 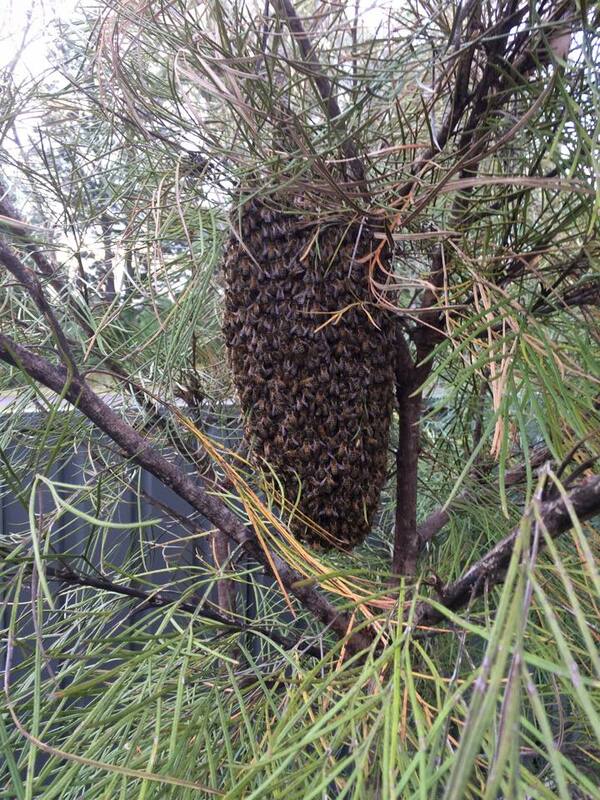 If you do have a bee swarm in your yard in the Southern Highlands feel free to call John on 0410590044. If he cant get them he can get in touch with someone who can and the bees will find a home where they can be safe and not a danger to anyone else. 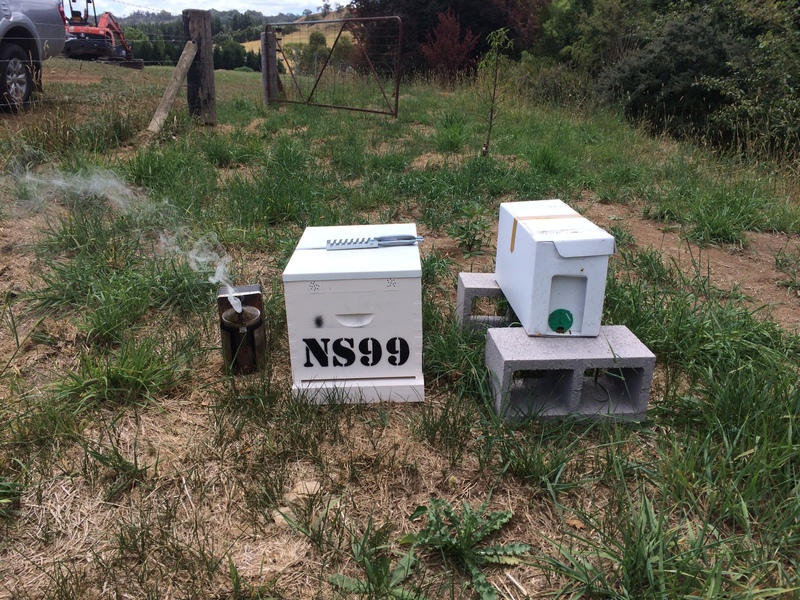 Transferring a nuc or nucleus hive to a Permanent Hive. There are a few ways to get bees for your new hive. The cheapest is to catch a swarm. Another way is to buy a package of bees. I think if you are going to buy bees then a nucleus hive is good value. A Nucleus hive is basically a starter hive with 5 frames of brood and honey with a healthy population of bees and a laying queen. They do cost a little more than a package of bees but it is a much better start for your new hive. 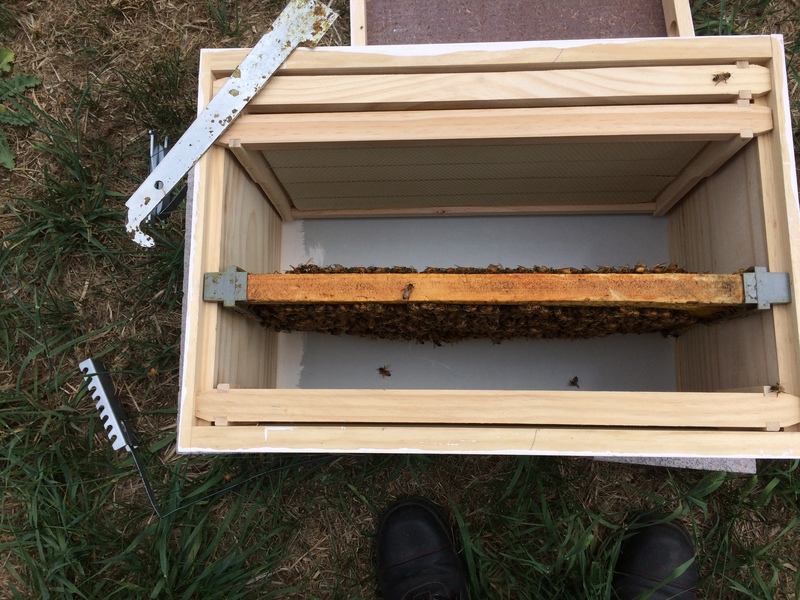 When you pick up your nuc it should be placed in the exact position that you intend for your new hive. Leave it there for a few days before transferring the frames so the bees can get used to their new environment. 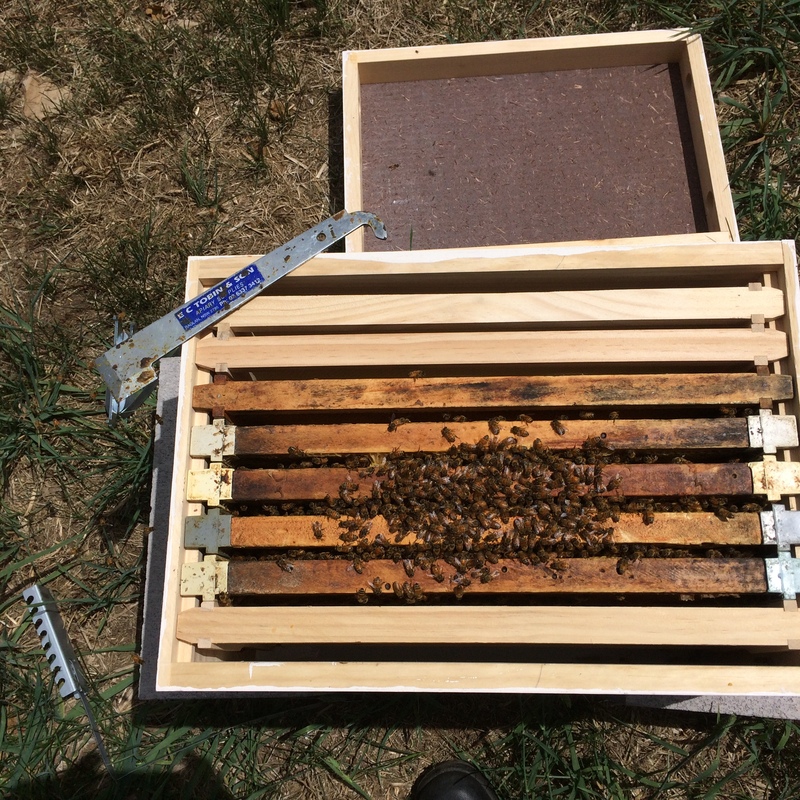 After a few days when you have a nice warm sunny day you can transfer the frames from the nuc to the new hive. 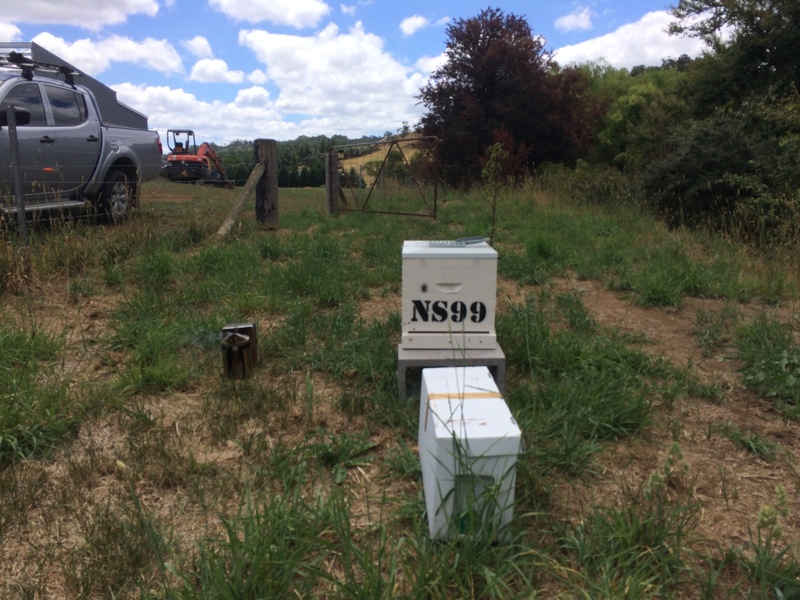 The first thing you need to do is move the nuc about 1 metre in front of the planned hive position and place the new hive in its place. 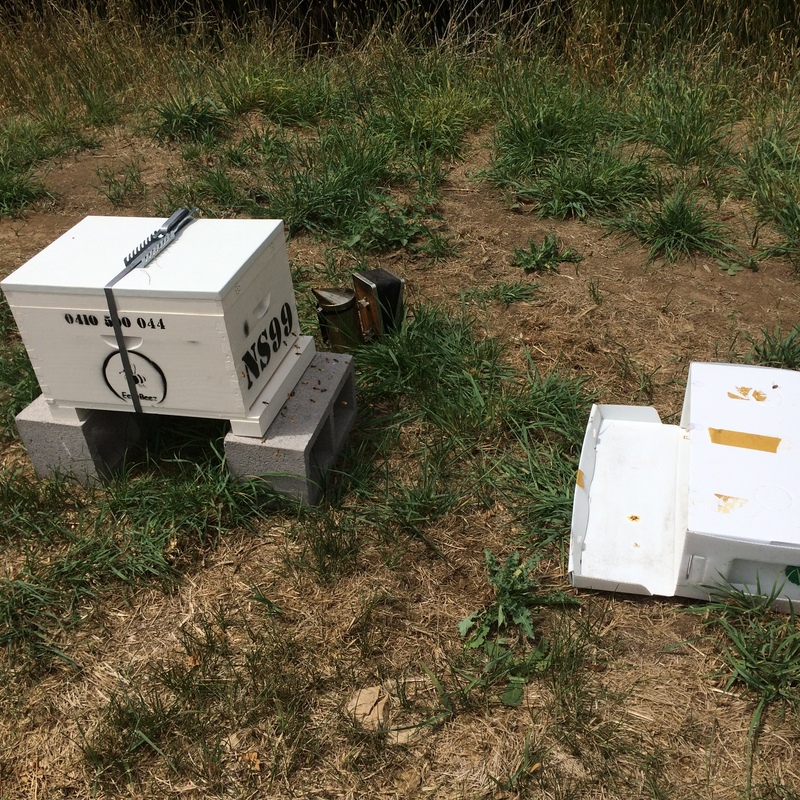 Move nuc 1 metre in front of planned position and replace with new hive. Once you have the new hive in place open it up a place frames of foundation in it. for this hive we are using an 8 frame box so we need 3 frames to fill the box after the 5 frames from the nuc are transferred. If you are using 10 frame boxes then you will need 5 frames of foundation. The frames of foundation should be placed toward the outside edge of the box. It is now time to transfer frames from the nuc to the new hive. Start by removing one frame in from the outside frame first. 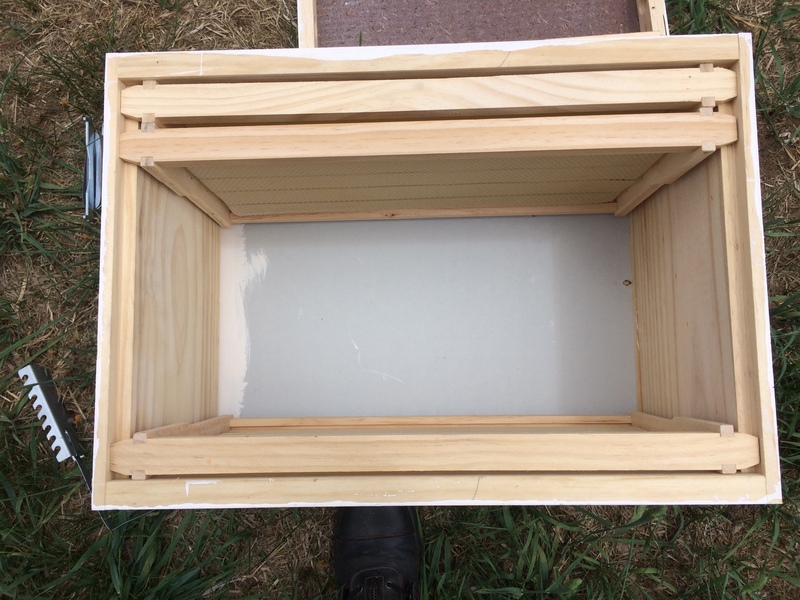 Place this frame in the new hive leaving enough room to easily place the outside frame in the hive between it and the frames of foundation. The first frame placed with enough room to put the outside frame between it and the frame of foundation. The remove the outside frame and place it between the first frame and the foundation. and push them gently but snugly up against the foundation. Place the outside frame between the first frame and the foundation. As you transfer the frames give them a quick check for honey, eggs and larvae and generally health. Transfer the rest of the frames from the nuc into the new hive keeping them in the same order until they are all transferred across. All the frames transferred from the nuc to the new hive. Be sure to keep them in the same order. Once all the frames are transferred you will need to be sure the queen hasn’t been left in the nuc. If you have seen her on one of the frames and you know she is in the new hive then there will be no need to check. If you haven’t seen her then carefully check the nuc for the queen and tip the bees left in it into the new hive. If you forget to do this you may find the many of the bees will leave the new hive to rejoin their queen in the nuc. 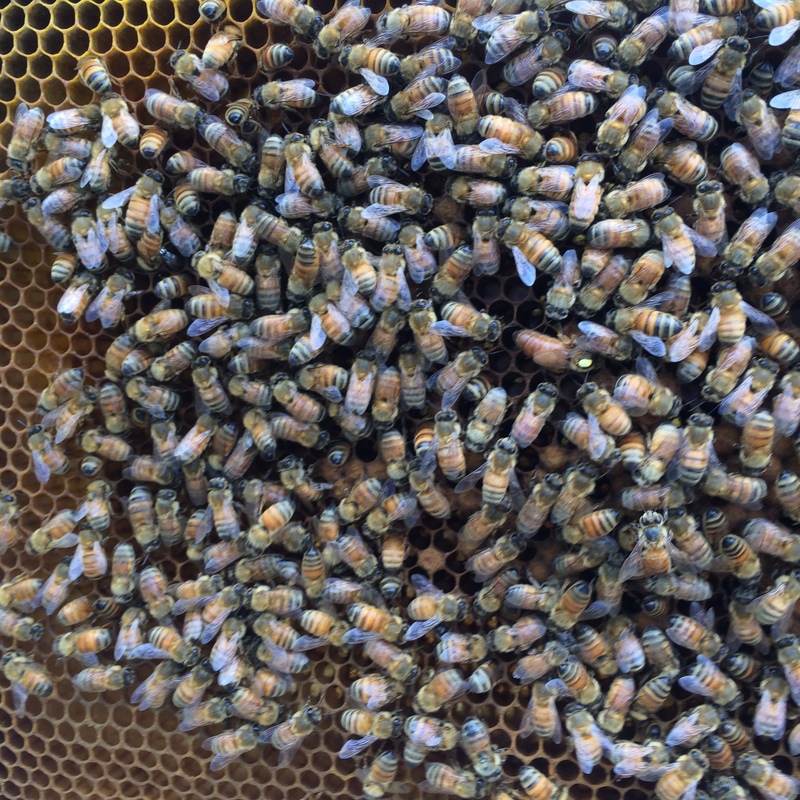 Check the empty nuc to make sure the queen isn’t still in there. 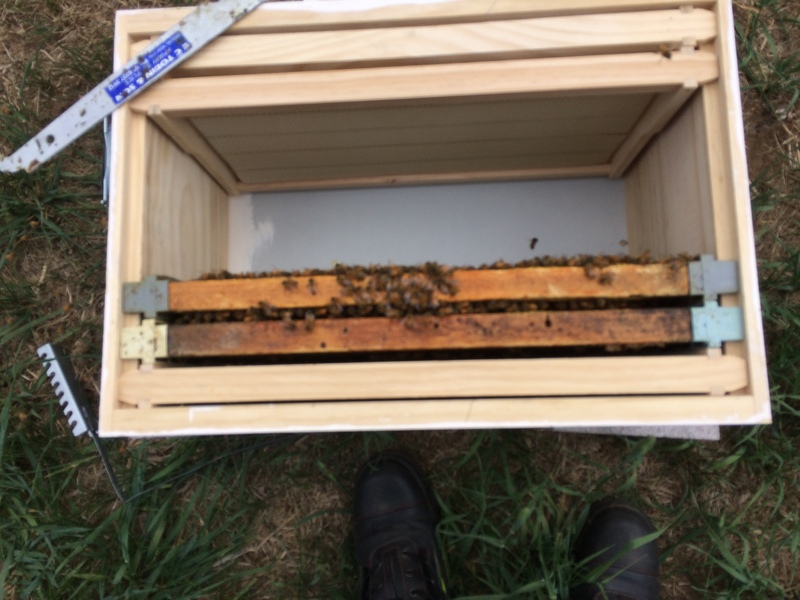 Once you have checked the nuc you can make sure the frames in the new hive are pushed snugly together and centered and close the hive up. Then lay the empty nuc on the ground in front of the hive so any left over bees can find their way into the new hive. The new hive all closed up and the empty nuc laying in front of the hive for any remaining bees to find their way to the new hive. You now have happy bees in your new hive and hopefully in a few months time you will be able to harvest some honey from them. Bee Swarm season in the Southern Highlands will be here soon. It is early August in the Southern Highlands and I have already heard of bee swarms in the Sydney area. This means it wont be long before we see bee swarms in the Southern Highlands. Bees will swarm once they feel they are growing too big for their current hive and resources in the environment will allow for further expansion. When the beehive swarms, the old queen will take half the population of the hive who will all fill with as much honey form the hive that they can carry and they will leave to establish a new hive. 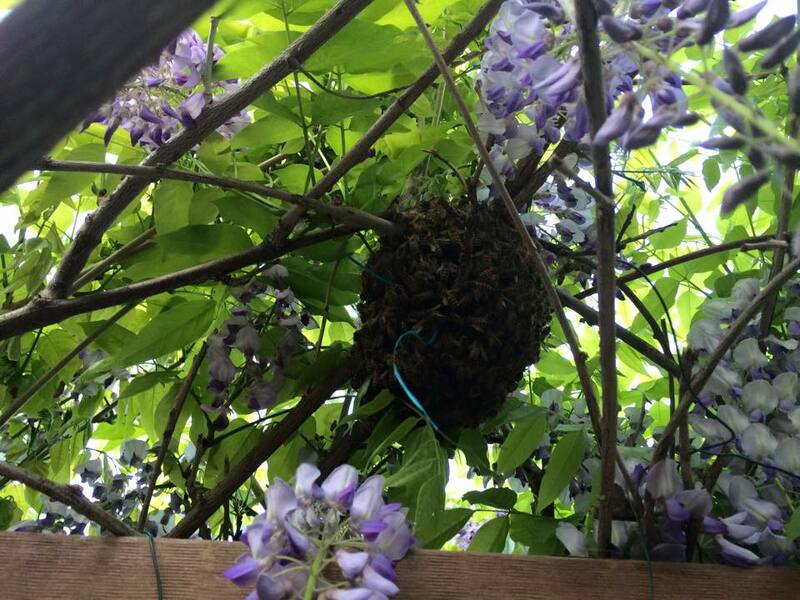 While the swarm is looking for a new place build a hive they will hang in a big bunch in a tree or shrub or on the side of a building or any other place they find. In the meantime, scouts from the swarm will go out and look for a new place to build a hive. It could be a hollow tree and a wall space in a building a garbage bin or even a telephone pit. Yes I have seen this personally. Once the scout has a found a good place she will return to the swarm and do the waggle dance to tell everyone about what she has found. When they find somewhere they like the whole swarm will take off and go to that place to make their new home. some ones house or in a tree in the garden where they can be much harder to remove. If you have a bee swarm in the Southern Highlands you can give John a call on 0410590044 and he can come and collect them and give them a new home where they can do their job of pollinating plants and we can eventually collect some of their excess honey from them. Bowral and Moss Vale and all the villages from Colo Vale, Hill Top and Yerrinbool in the north to Exeter, Bundanoon and Sutton Forest in the South out to Robertson in the east. Bees are not meant to be hard to look after. Bees are not meant to be hard to look after. In fact once you know they are easy but they do take a bit of time and time to look after them can be a scarce resource. That is where EezyBeez can help. 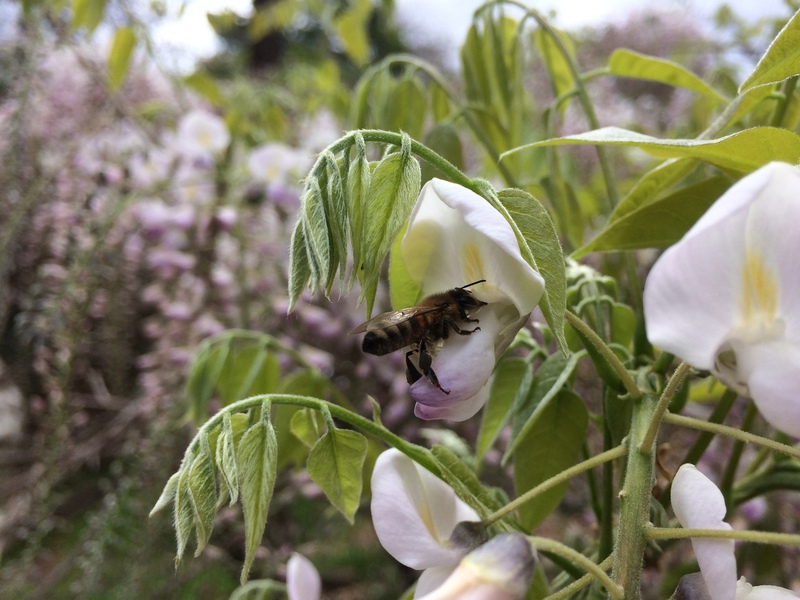 If you need some help learning or you dont have the time to look after bees but you would like to have some them we can help you.